Julius Caesar may have been Rome’s most famous dictator, but he certainly wasn’t the first. Dozens held the title in the early Roman Republic, wielding varying degrees of absolute power, up until 202 BC. After that, the title was seemingly abandoned for more than a century, until someone rose up to claim it again: Lucius Cornelius Sulla (138 – 78 BC). Although he re-instated the role of dictator, Sulla did not wish Rome to evolve into an autocracy. In fact, Sulla relinquished his totalitarian power once he thought his actions had secured the Republic’s future. Even so, Sulla’s actions upset Rome’s powers structure to an extent that facilitated the ascent of Caesar and his successors. Intentionally or not, Sulla’s turn at dictatorship proved the prelude to Empire. Sulla hailed from a patrician family, and reportedly spent his youth consorting with Rome’s performance artists. It was not until his thirties that Sulla earned fame for his first significant accomplishment: the 107 BC capture of the Numidian usurper Jugurtha. After Sulla turned forty, he distinguished himself as administrator over Cilicia, battling pirates and thwarting a Persian invasion. After that, the rising general returned to Italy, joining the fight against several city-states that were former socii, or allies, but now sought separation from Rome. That conflict, known as the Social War (91-88 BC), secured Rome’s mastery over the Italian peninsula and propelled Sulla’s career even further. Sulla managed a series of impressive victories, including one after which the troops awarded him their very highest form of exaltation: a corona graminea, or grass crown. Sulla also managed to win the post of consul, Rome’s highest elected political office. Even while Rome outlasted its enemies in the Social War, another crisis brewed. To the east, Pontic King Mithridates VI planned and plotted his realm’s expansion. In a shocking development, Pontus launched a highly orchestrated massacre of many thousands of Roman men, women, and children residing throughout Asia Minor. Rome sought revenge, and Sulla was the Senate’s logical appointee for the task. However, Sulla’s military and political mentor-turned-rival, Gaius Marius, preferred his own glorification, and managed a popular assembly’s override of the Senate’s decision. The political unrest spawned violent protests and rioting, even within the Forum, the very center of Roman public life. Sulla, who had a long history with Marius, decided that Pontus could wait. He mustered his available forces (six formidable legions) and marched against Rome. It was the first time that a Roman general had ever stormed the Eternal City. The forces supporting Sulla (mostly the optimates, or “best men,” who championed oligarchic rule) battled those favoring Marius (mainly the populares, who preferred power via popular assemblies). Sulla’s battle-hardened forces proved stronger, and Marius barely managed to escape. Sulla proceeded to establish his power over Rome, at least to the extent he re-established the Senate’s authority. Having stabilized the situation in Rome, Sulla turned his earnest attention to Mithridates. He rallied his troops and merged them with Rome’s remaining eastern forces to wage the First Mithridatic War. For further support, Sulla also called upon the realm of Bithynia, whose ruler, King Nicomedes IV, had developed the habit of giving up his throne to Pontus, then seeking Rome’s assistance to regain it. Sulla and his Bithynian allies waged several epic battles against Mithridates’ forces; of particular note was a brutal siege of Athens. By 85 BC, Mithridates was forced to surrender his control over Greek territories, not to mention a large portion of his own personal wealth. Meanwhile back in Rome, Marius returned, and managed his re-election as co-consul for an unprecedented seventh time. It proved his last; he died just two weeks later. It was enough time, however, to launch a vicious purge of Sulla’s supporters. After Marius’ death, his co-consul, Lucius Cornelius Cinna, continued persecuting the pro-Sulla faction. With Pontus out of the way, Sulla returned his attention back to Rome and retribution against his domestic enemies. Cinna, perhaps fearing Sulla’s growing popularity, decided that the best course of action was to set forth from Rome with a pre-emptive attack force. Cinna’s men, not eager to engage Sulla’s battle-hardened veterans, decided to murder their leader instead. Although Marius and Cinna had both been eliminated, many of their followers (referred to as the Marians) remained, and still controlled much of Italy. But their power did not last for long. A highly determined Sula returned to Rome, and, with local supporters including future triumvirs Crassus and Pompey, he once again waged civil war. In 82 BC, he achieved final victory at the monumental battle of the Colline Gate. Subsequently, the Senate granted Sulla the title dictator legibus faciendis et reipublicae constituendae causa, meaning dictator for the making of laws and for the settling of the constitution. Apparently, no term limit applied, effectively bestowing perpetual, unlimited power. It was now the great imperator’s turn to carry out bloody proscriptions. Sulla reportedly killed thousands of Romans who he deemed had acted against the Republic’s best interests. Escaping the bloodbath was Julius Caesar, a potential target since he happened to be Cinna’s son-in-law. Sulla reportedly lamented his failure to deal with Caesar, foreseeing him as a future threat to Rome’s political system. Besides brutal proscriptions, Sulla issued many reforms to promote economic recovery, as well as renew the power and prestige of the Senate. Sulla also issued coins, including this well-preserved denarius, probably struck by his own travelling military mint. 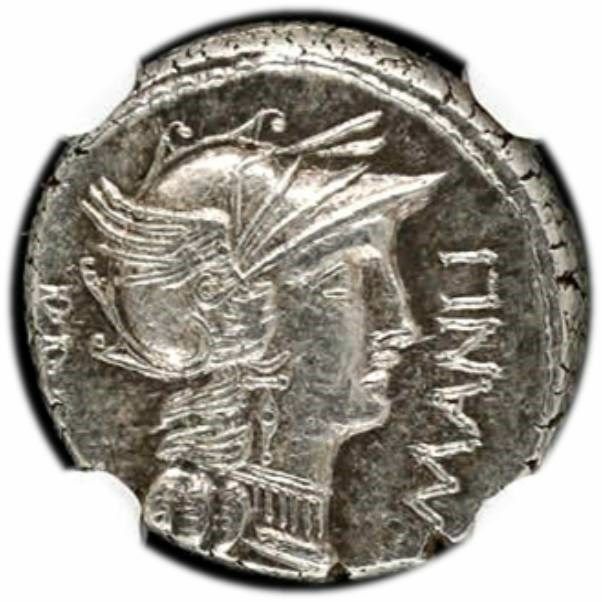 The obverse features the classic motif of a helmeted Roma, along with the inscription PROQ L MANLI T, indicating Lucius Manlius Torquatus, Sulla’s proquaestor during the Pontic war. 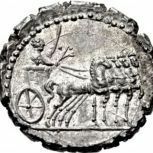 On the verso, an exultant figure drives a quadriga (a four-horse chariot), while holding a caduceus (a winged staff), and being crowned by Victory (the Roman goddess personifying the same). Based on the inscription L SVLLA IMP, the scene was probably portrays Sulla celebrating a triumphus, or triumph (a public ceremony reserved for Roman military commanders who have achieved a great victory). 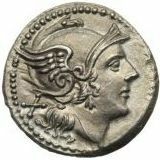 It is not clear which victory is being represented, and it may be the case that Sulla issued the coin in anticipation of his final victory over the Marians. It is conceivable that Sulla approved of the design, despite the numismatic tradition that living Romans not be depicted on Rome's coinage. In 81 BC, Sulla, keeping his resolve to maintain Rome as a Republic, resigned as dictator and restored the Senate's power. He served as consul for a second term, then retired from public life in 79 BC. He died shortly thereafter. Sulla married five times, and sired several children, ensuring the continued political prominence of his clan for decades. More than descendants, precedents define Sulla's legacy: marching on Rome, reigning as dictator, and even issuing coins invoking his own image. These bold moves set the stage for similar actions by Caesar and the Republic’s subsequent transformation to an Empire. Like many figures of ancient Rome, Sulla's personal history is complex and subject to interpretation. His brilliant, yet brutal, tactics were enacted not merely for personal glory, but also out of a deeply-rooted patriotism and his own sense of justice. Sulla is perhaps best epitomized by his purported epitaph: "No friend ever served me, and no enemy ever wronged me, whom I have not repaid in full." Previous entry Et Tu, KOSON? I have seen you mention a few times the travelling military mint. Were the coins made by these obviously discernable from other mints? Can you give a general background on the travelling mint? 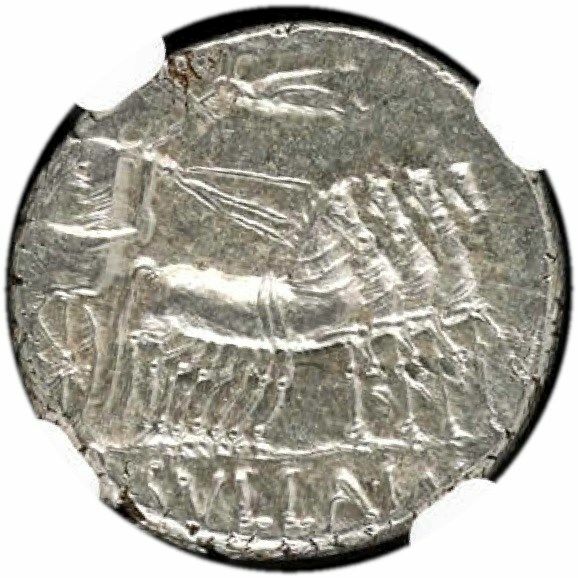 I am not an expert on this point, but from my researching it appears that the coins produced by military mints, especially during the and Imperatorial periods were produced in all major metals/denominations (e.g., bronze, silver, gold) and were of the same size, shape, mass, and artistry, an used the similar motifs as official produced coins. It is pretty amazing for the time to think how practical and efficient the Romans were, given that they could accomplish a mobile mint which required, at minimum, infrastructure required to produced the coins, namely skilled workers to set up, maintain, and operate the equipment, and the workers to strike the coins, not to mention dealing with storage and security related to carry around a large mass of precious metals! ...and, adding to the debate over who was the first living Roman on coinage, the author of that link posits it may have been Scipio Africanus!? Thank you. I will check that link. I had been hunting for this coin for a while, and I passed on a few "raw" opportunities since, exactly as you say, I was not keen on the strike and/or condition. I saw this one selling as already encapsulated, and I could not resist the chance at such a nice speciment! Thanks for your comment, I am glad you found worthwhile to read! I am currently looking at Sulla coins to purchase but it appears the pricing is all over the place - something I've noticed buying ancient coins. Could you help me gauge an actual price for a vf Sulla? Thanks for your time and consideration! I completely agree with you on the pricing of ancient coins being all over the place. At least with modern coins, in particular slabbed modern coins, there are usually a plethora of specimens of each date/mint to choose from, and their strikes and surfaces are very consistent (cleaned coins are a notable exception of course! ), so the pricing is relatively competitive and consistent, for instance from dealer to dealer. When it comes to ancient coins, each type is relatively more rare, oftentimes extremely rare, and much more variable in their strike and the chemical degradation on their surfaces. I think that NGC is the on the correct track in that they not only give a traditional grade on the ancient coins' condition (like VF), but also give their opinion of the strike and surface quality as well. Having said that, I am not necessarily suggesting you should be an already NGC-slabbed Sulla coin. Actually, most ancient coin collection eschew "slabbing"; I am in the minority in that I prefer to slab my ancients. Indeed, at this point in my ancient coin collecting journey I almost exclusively purchase "raw" coins, and then I encapsulate later. It took me time and experience to get comfortable with that. (I will post detailed comments on that in the future.) Having said that, I do have a number of ancient coins that I decided not to slab, for various reasons, including that sometimes I prefer to hold certain coins directly in my hand. I encourage you to get multiple perspectives on collecting ancient coins, but as a start I will provide some of my own thoughts. For collecting ancient coins in general, I advise at the beginning a bit of patience. Peruse what is out there currently, and study the prices, descriptions, and photos of each one, especially for your own impression of "eye appeal". Even if the coin has chemical degradation on its surface, understand that is also part of that particular coin's history, and sometimes can be artistically appealing (I will post my comments on my Domitia coin later to give more of my perspective on that point). If the photos are not well done, then I would avoid (means the selling is either trying to hide something or isn't experienced, both have obvious drawbacks). I like to purchase from auctions (a few good places to at least look are CNG auctions, Heritage, biddr.ch, etc). I personally do not recommend ebay for ancients, unless in NGC slab. Another great place to look at is vcoins or ma-shops (a lot of dealers are there). For not only upcoming, but importantly previous realized price, other good resource are out there such as coinarchives, and there are similar sites as well. Once you have seen what is available, you can choose from that, or wait for new examples to come to market, for example a lot of auctions occur each month. Once you see what seems good for you, then you have some confidence that it is the right time/price to go for it. Could you help me gauge an actual price for a vf Sulla? I would need to know exactly which Sulla coin you want? For the moment I would assume that you are looking for the same denarius I posted. In this case, I would say probably $300-$400 range for VF example, maybe up to $500 for example with high eye appeal. I realize that is still a big range, but that is where VF doesn't tell the whole story and strike/surface comes in. That one sold for about $300 US + commission, and I think has a lot of nice eye appeal (I am surprised it did not sell for higher, actually). This one sold for $340 + commission, and I think the first was nicer. I hope my diatribe-ish response helps! $200 say I! But "VF" means not a lot with these coins. 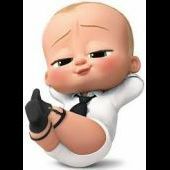 Something, for sure, but it is not enough enformation. No VF denarius is going to have that brilliant luster of the mint state example shown here. Which we all want. But the dies within the same series of denarius are often pretty different from each other, some crappy, some beautifully engraved. These are thought to be a military issue, from a traveling mint, so we expect a little haste in their preparation. But I think you should log onto Numisbids or Sixbid, not Ebay, and search "SULLA" and you will find some raw examples going to real auction in the next 45 days that will close under $300 + commission and shipping. What grade? Who knows. But some might be (1) well centered (2) and contain all the legible letters of "SULLA IMP" on the back and (3) not have too much of the Sulla figure's head cut off and (4) have the obverse head well centered on the coin. People after these coins, we have to assume, have read about Sulla, and that is why these coins sell at some premium over contemporary issues without his name on them. Raw coins are important to start with, or at least have around. I have a dish of denarii I accumulated 10-15 years ago off ebay. Those are for handling, not slabs. I have about 10 venetian and netherlands ducats raw that are pretty worn down. Also for handling and not grading. You like ancient coins because they're old right? And old people used them, right? So you want to touch them and feel their density. I wanted to literally get my hands on these coins after I read a book mentioning them and their significance, or mentioning them in passing while discussing the historical periods. Whether they were filed, clipped, bent, worn down, or even holed, was of secondary importance, and even lent to their credibility. Keep in mind, my wife doesn't think my ancient coins are real, whatever NGC says. NGC sent back one gold coin, a 1576 Hungary Ducat, as "questionable genuineness" and my wife said "of course they're going to do that sometimes, so you believe them." Anyways, raw coins are awesome, and when they are in not-great-shape, they are surprisingly affordable. Once you want to collect for something to pass on, or that might even increase in its ability to attract demand, then you want incredibly preserved perfect looking coins, and you might want to verify their perfection and protect them in an NGC slab. Helps your heirs figure out what the stuff was too, even if they don't believe it.